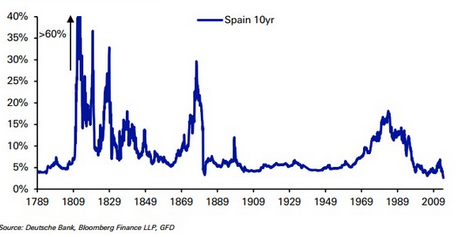 Spanish 10-Year Bond Yield Lowest Since 1789! The interest rate offered on the secondary market for Spanish bonds maturing in ten years is at historic lows, below equivalent yield in U.S. treasuries, which has not happened since April 2010. The evolution of Spanish debt is even more striking when viewed from a broader temporal perspective. Today the Spanish 10-year bond is the lowest since at least 1789, the year of the French Revolution, as noted in the graph above. This is something unprecedented. ZeroHedge picked up on this as well, in his post: The Great Insanity In Context (200 Years Of European Bonds), citing France and Italy as well as Spain. Draghi has certainly made a huge impact on financial markets as Friday saw some landmark levels hit across different assets. Many European bond markets hit yield lows with quite a few hitting fresh multi-century all time lows and many others flirting close to them. 10 year French yields hit 1.654 intra-day which was the all-time low covering our entire data history back to 1746. 10 year Spanish yields also hit all time lows with our data going back to 1789. Italy has only been lower in yield for a few months in early 1945 (data back to 1808). Spanish bonds are priced as if there is zero percent chance Spain leaves the Eurozone. Even if you believe the risk is low, I assure you it is non-zero. And what about separatist movements in Spain. I guess that is a zero percent chance as well. It’s the same for Italy. Apparently Beppe Grillo has a zero percent chance of getting his way in Italy. Let’s assume for a moment there is no chance of any of the above happening. What about further bailouts or more importantly bail-ins in Spain and Italy? Are those zero percent risk as well? Apparently so. Indeed, there is no risk anywhere in anything except gold, so go on margin and buy calls like the rest of the herd. You cannot lose (and that is exactly the same kind of central bank sponsored insanity that led to the housing crash and the global financial crisis). I never thought it would come to this so soon again. How quickly we all forget.